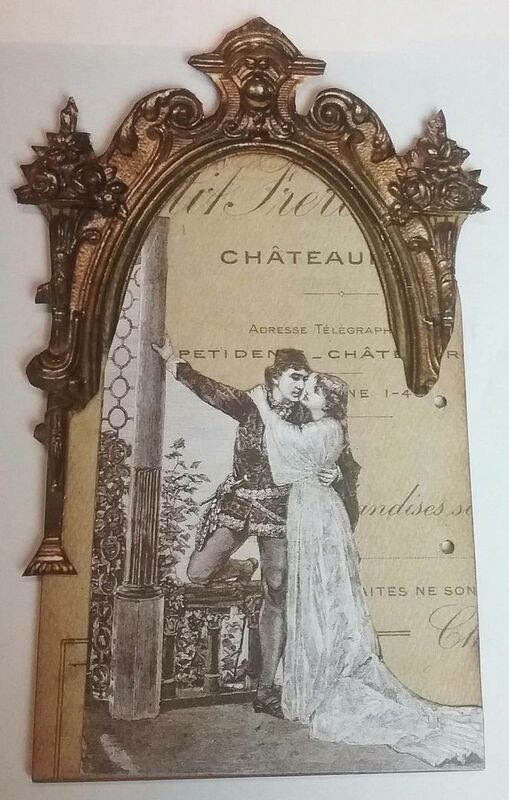 As part of the countdown to Valentines Day, I have two more romantic themed pieces to share. 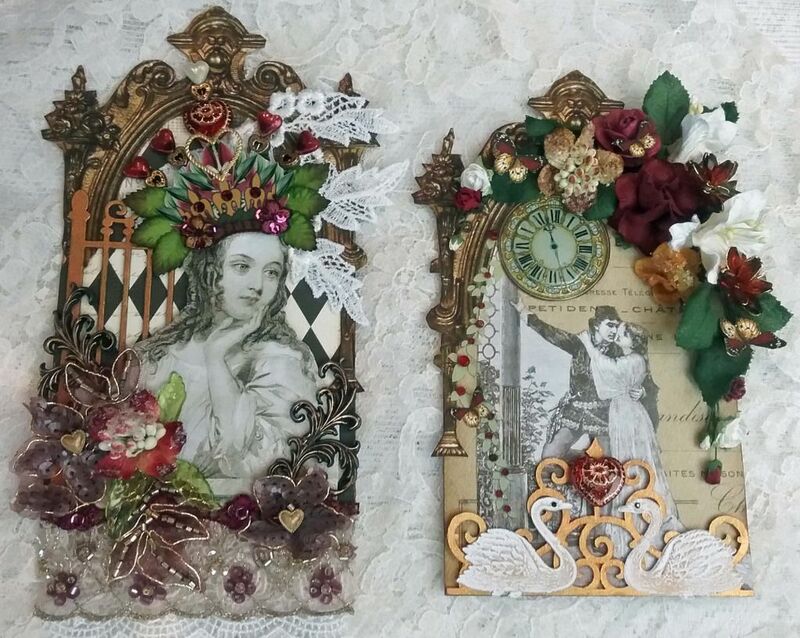 These pieces were started last year when the Alpha Stamps Star Crossed Lovers Kit came out in January 2015. Usually when I work on a kit I make more than one piece, sometimes even three or four. This was one of the additional pieces which didn’t get finished as I was not happy with the direction I was going. I had originally hinged the two pieces together, but after laying out different designs I just wasn’t happy. In a last ditch effort to save them from the trash can (which is where pieces I hate go), I took them apart and focused on them separately (which finally took me to my happy place!). 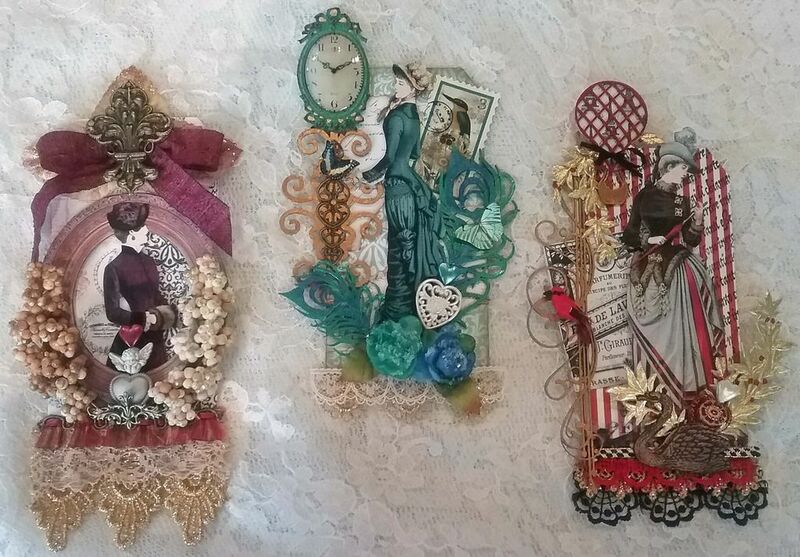 For both of the pieces I started by covering a piece of chipboard with decorative paper. 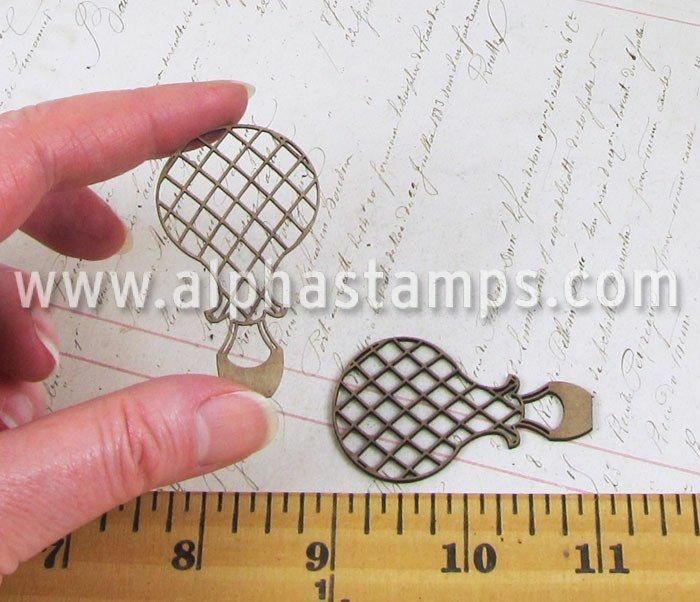 Next, on both pieces I added images from the Alpha Stamps Juliet Collage Sheet. 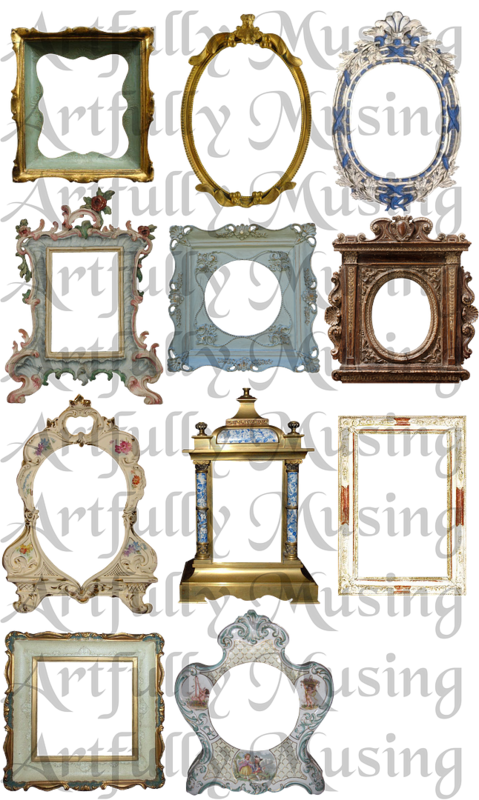 I also used one of the frames from my Elegant Frames Set Download. I printed the frame twice and cut away part of the bottom of the frames (the back of the frame is covered with coordinating cardstock). 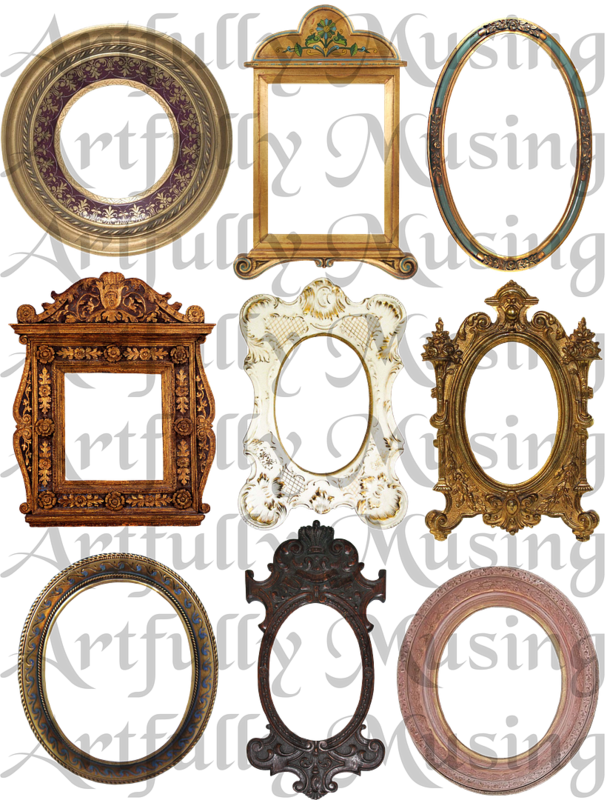 The frame I used is the last one (far right) on the second row in the picture below. I love using large frame images to give a piece structure. In the picture below you can see the holes going down the right side of the piece, but no worries as the cascading flowers will hide my misstep. I started building the flower cascade by attach leaves from my stash. I think these leaves had a flower that I used on another project. Next I added the larger burgundy, white and yellow flowers. The brown beaded flowers are from my stash. Next, I added the smaller burgundy and white roses and rose buds. The ones on the right hide the holes. 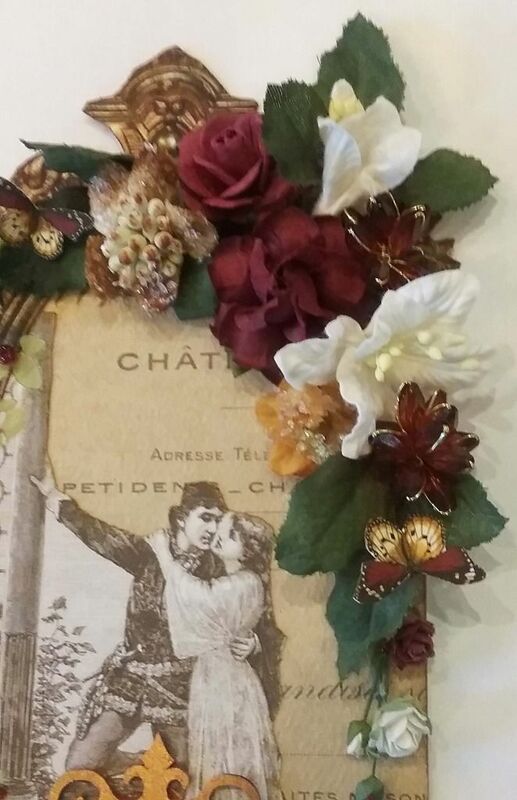 As a final touch to the flower cascade I added paper butterflies. On the left side of the piece I added a green vine using a rub-on from my stash. Red bead add a sense of red buds on the vine. 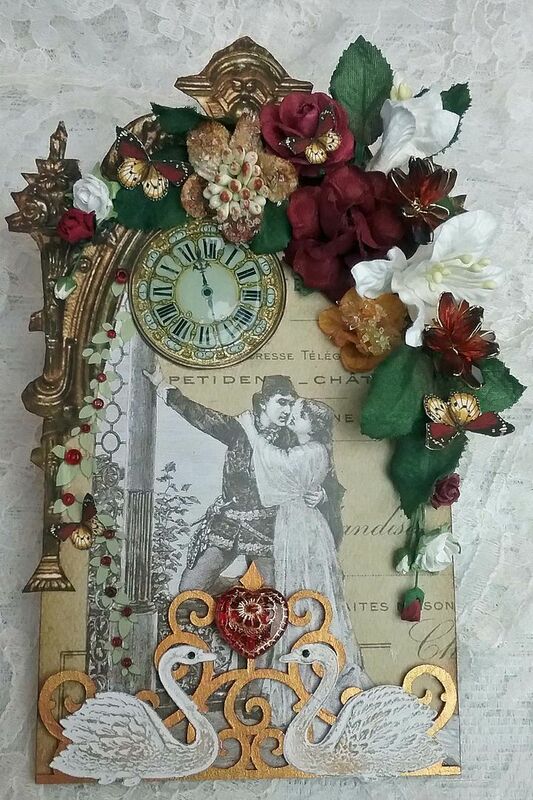 In addition to the vine, I used a clock from my Tick Tock collage sheet. I added Glossy Accents to the center to give it a domed and shinny appearance. At the bottom I added a chipboard flourish painted gold, two Dresden white swans rubbed with Inca Gold Gilders Paste and black Swarovski crystals for eyes. The final touch is the red and gold glass bead. The approach for this piece was the same as the one above. 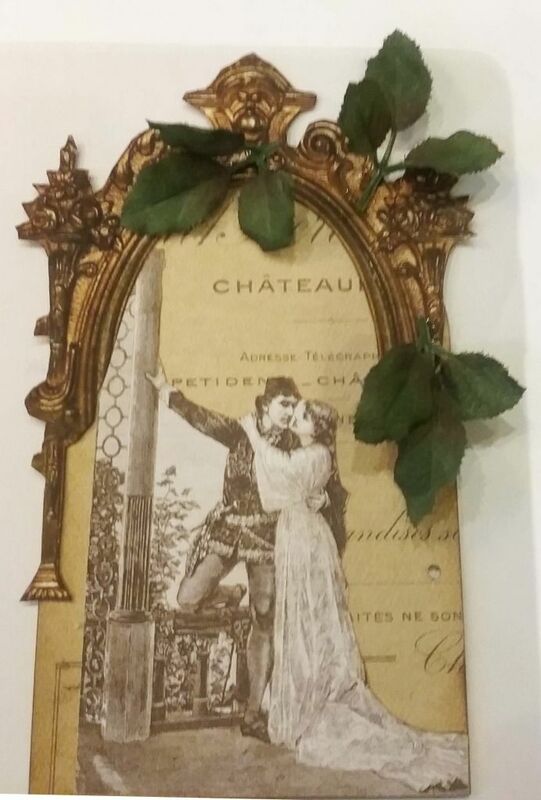 I used the same chipboard, paper frame, decorative paper (opposite side) and the image from the Juliet collage Sheet. 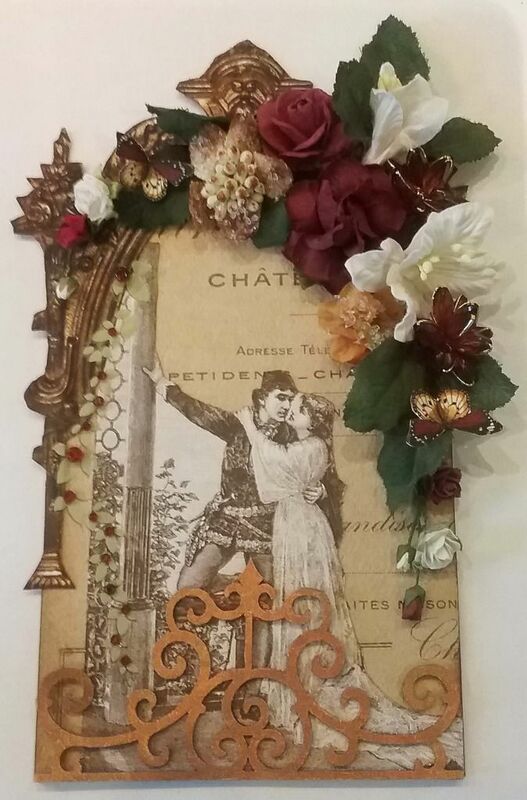 Next, I added half of a chipboard gate (painted gold) to give the piece even more of an architectural feel and to cover the holes on the left side. I also added lace (from my stash) to the top right side of the piece. Next, I glued the image in place and started building her heart crown. 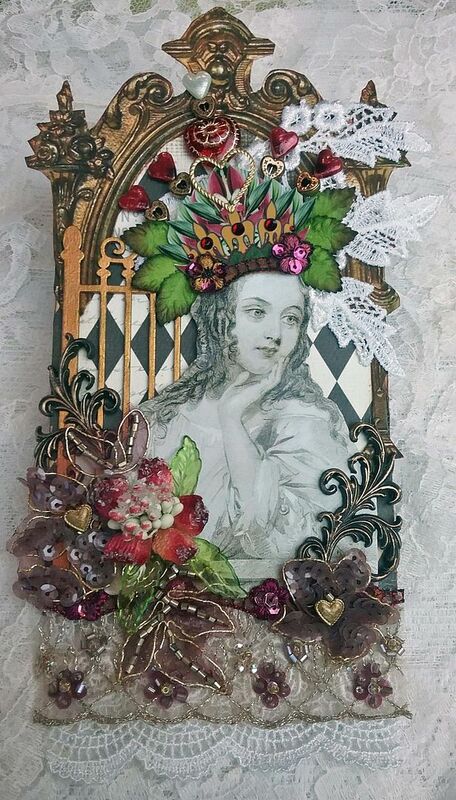 I used one of the crowns from the Natures Crowns collage sheet as the base. Using heart stick pins I added small heart beads and glued the stickpins behind the crown. In the center I also added a glass heart bead to the stickpin in addition to the small heart bead. To the front I added a gold heart, rhinestones, and a piece of trim to the crown. The final touch was to add some leaves behind the crown. To the bottom of the piece I added first lace, a large piece of beaded trim and a small piece of beaded trim. Next, I added resin swirls and beaded flowers. The final touch is the sugared bloom with acrylic leaves. 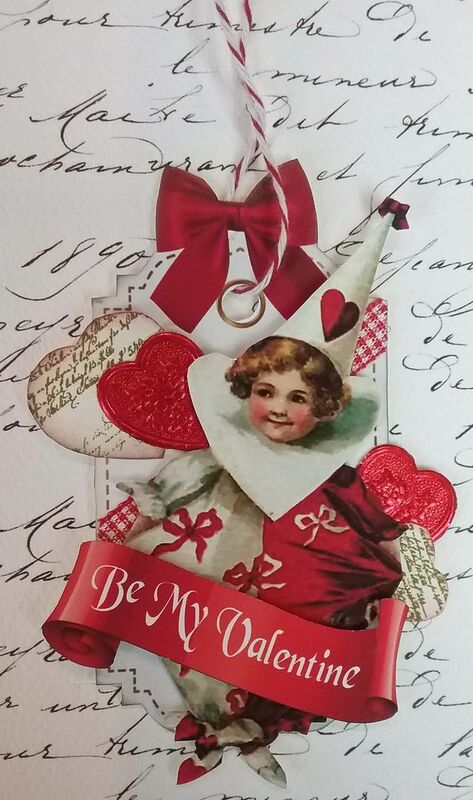 To kick off the New Year, I have Valentine themed tags to share with you. 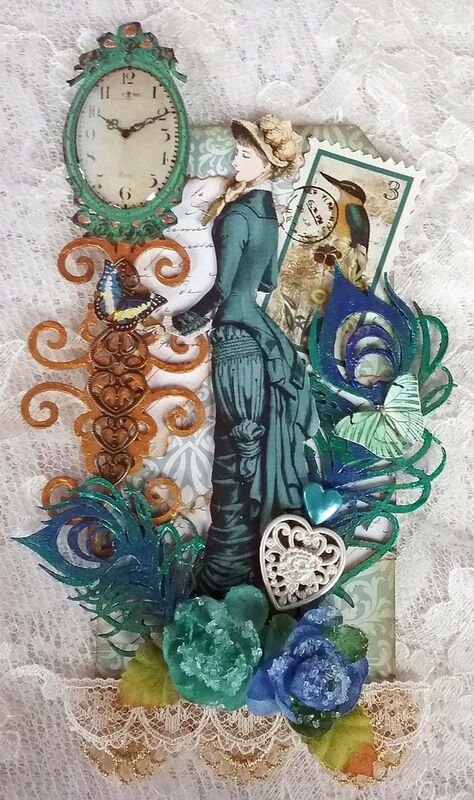 I've been doing so many miniatures lately I thought it would be fun change to create some collaged pieces. 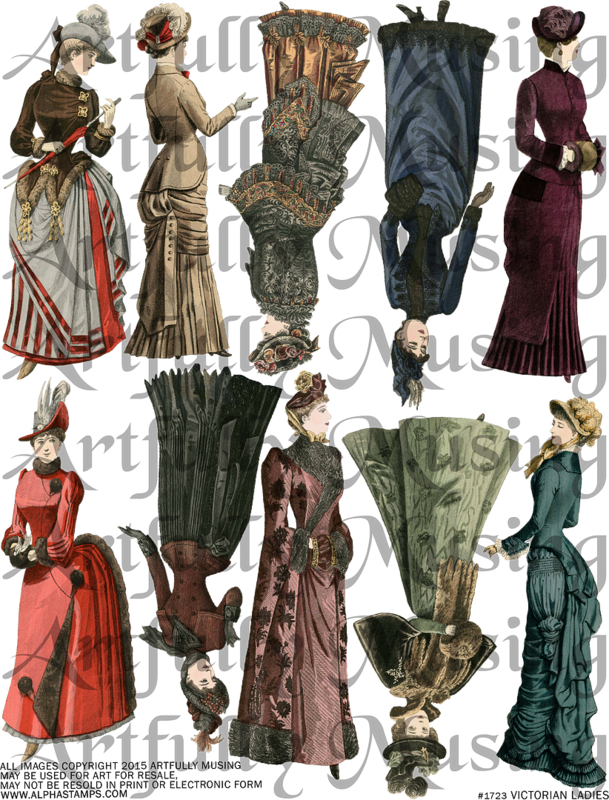 First up, are romantic art tags featuring Victorian women. You’ll notice on each tag, along with other elements, I’ve incorporated one or more hearts. 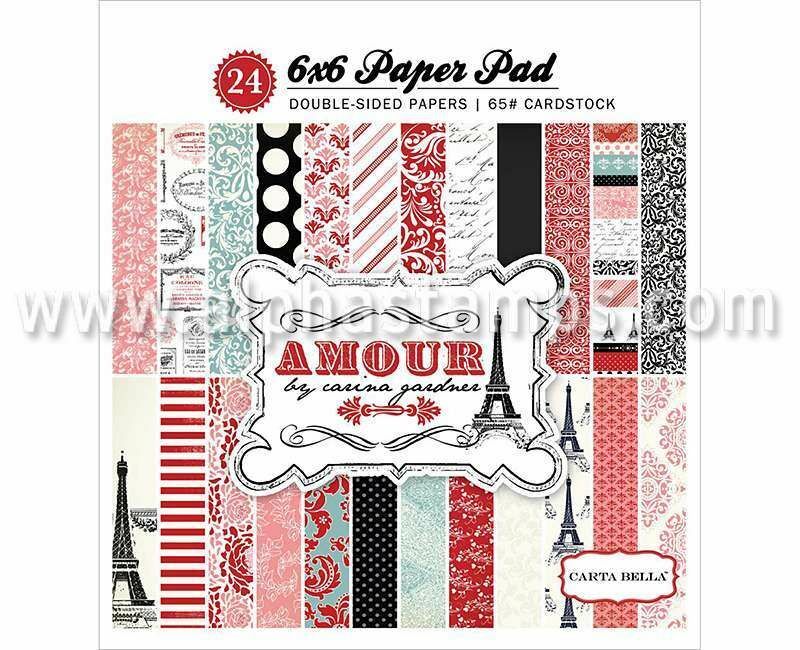 The Amour 6x6 paper pad I used for the tags is loaded with beautiful papers. 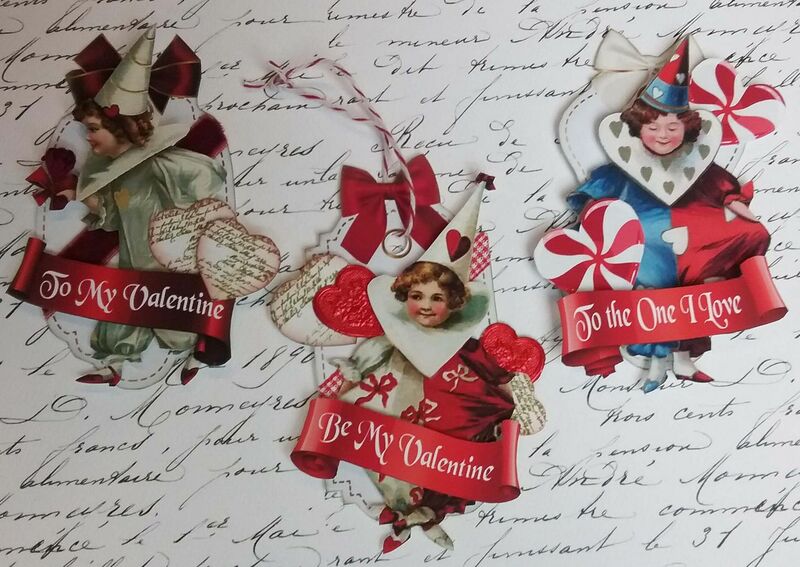 Next, up are fun vintage Valentine tags that can be used as gift tags or on a Valentine card and are super quick to make. 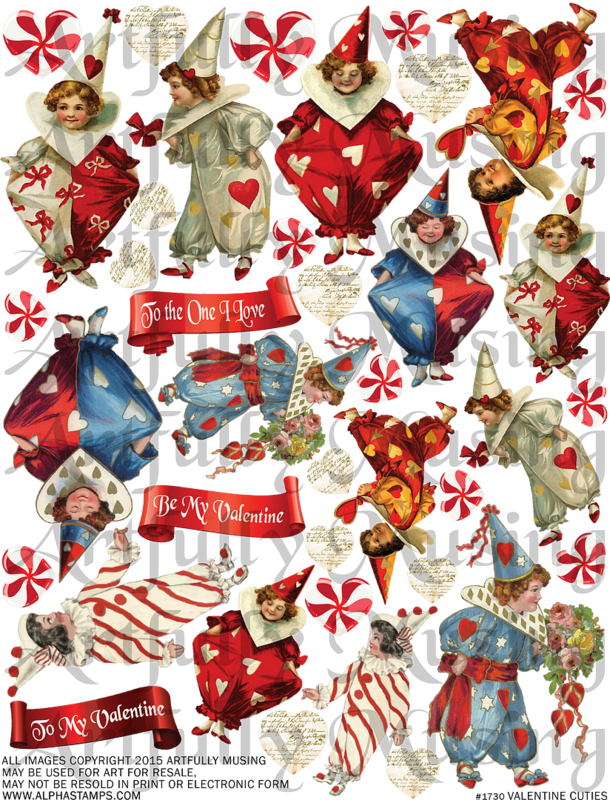 The images are from my new “Valentine Cuties”collage sheet. 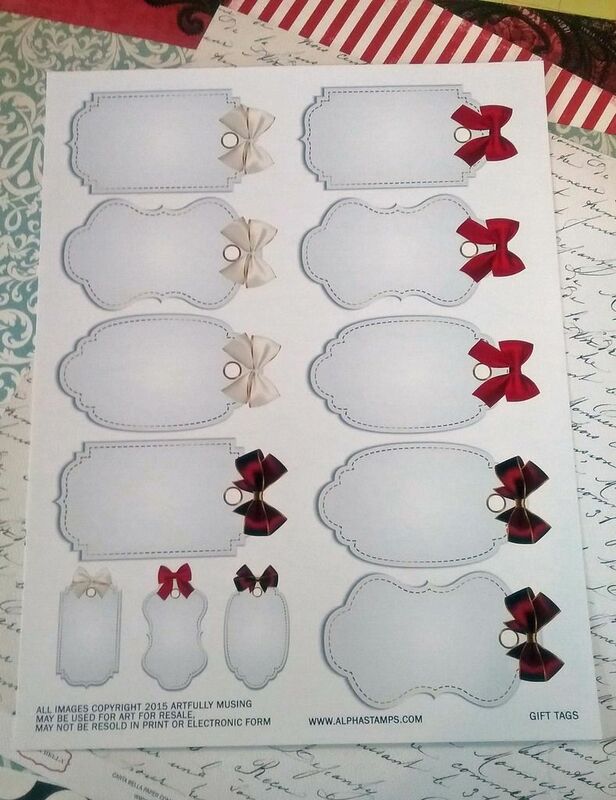 The base of the tags is a new gift tag sheet I’ve created that is free with purchase at Alpha Stamps (more details below). This new sheet includes 7 cuties in two sizes, three Valentine banners and two different styles of hearts in various sizes. Alpha Stamps is giving away a Gift Tag collage sheet (designed by me) with every order placed January 7th though the 10th. 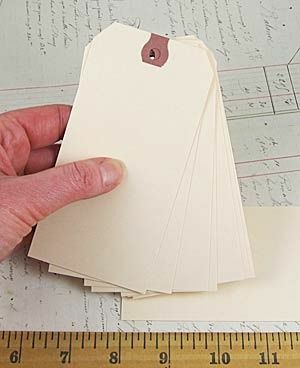 This versatile sheet contains 12 blank tags (in two sizes) that can be used for any occasion. 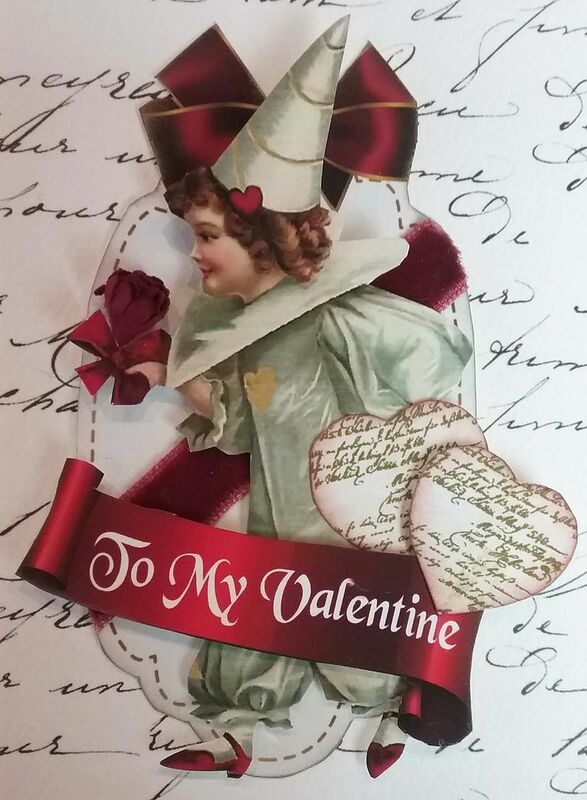 In addition to the images from the free Gift Tag and Valentine Cuties collage sheets, I also used ribbon to jazz up the tags. 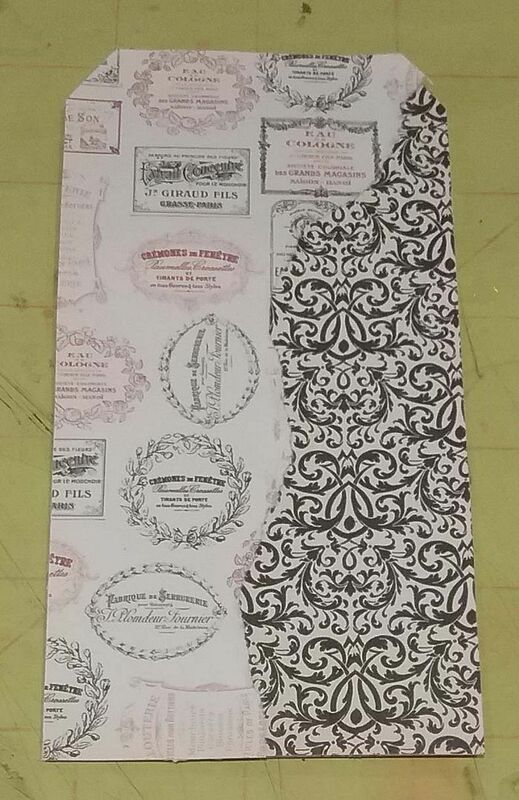 For each of the tags I used the Victorian Ladies collage sheet, Manila Tags (2-5/8"x 5-1/4"), and paper from the Amour 6x6 Paper Pad. For the red tag, I started by covering the tag with red and white striped paper from the paper pad. Next, I stamped the paper. 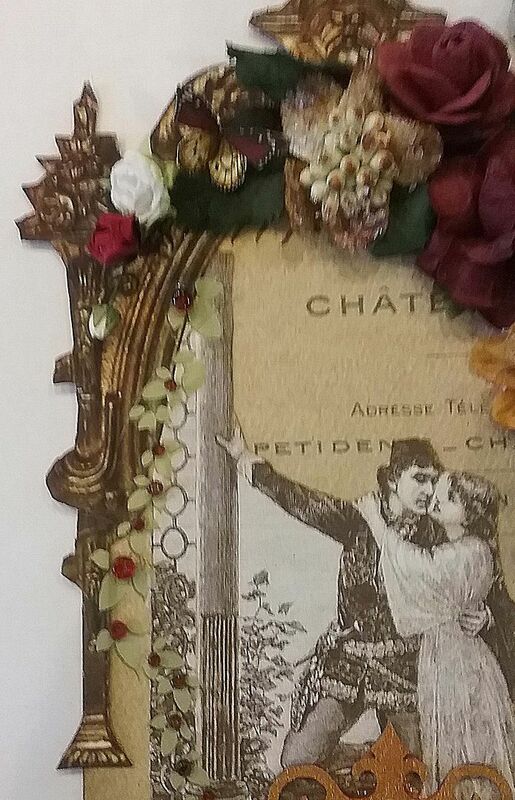 I continued building the background by using an image from the Perfermerie #1 collage sheet and an image from the French Floral Overlays collage sheet (printed on vellum). 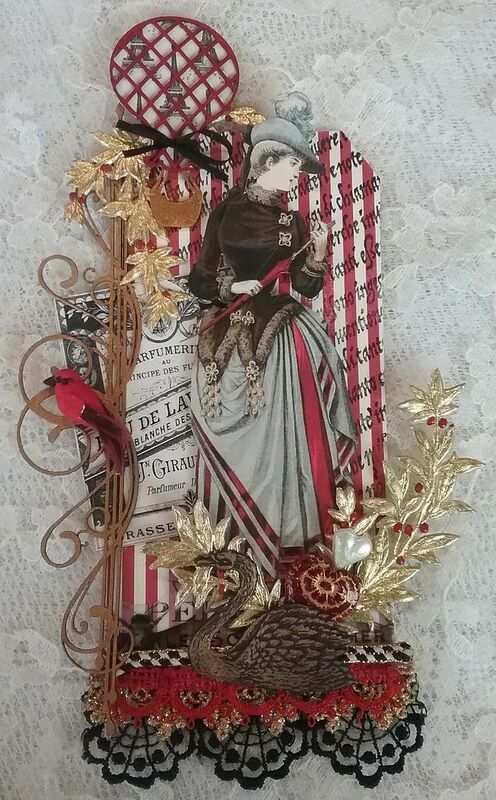 At the bottom I added red and gold lace and to the side I added a chipboard scroll painted gold. 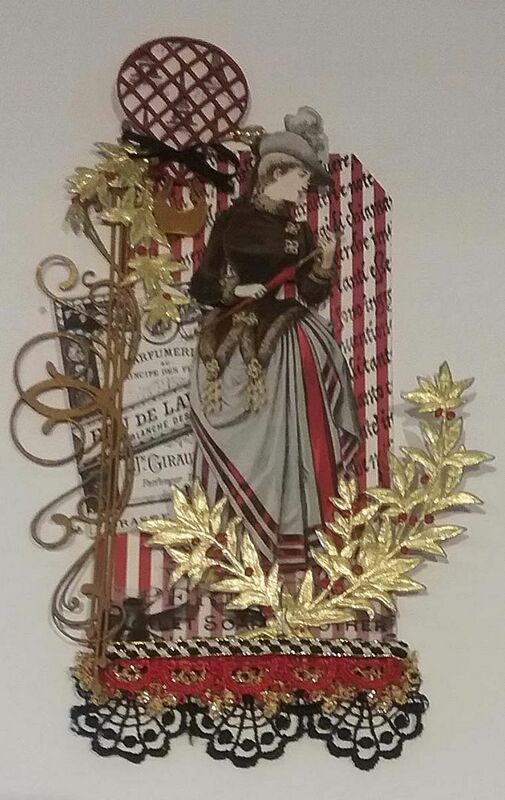 Next, I added the woman (focal point), Dresden myrtle leaves, and a chipboard hot air balloon. 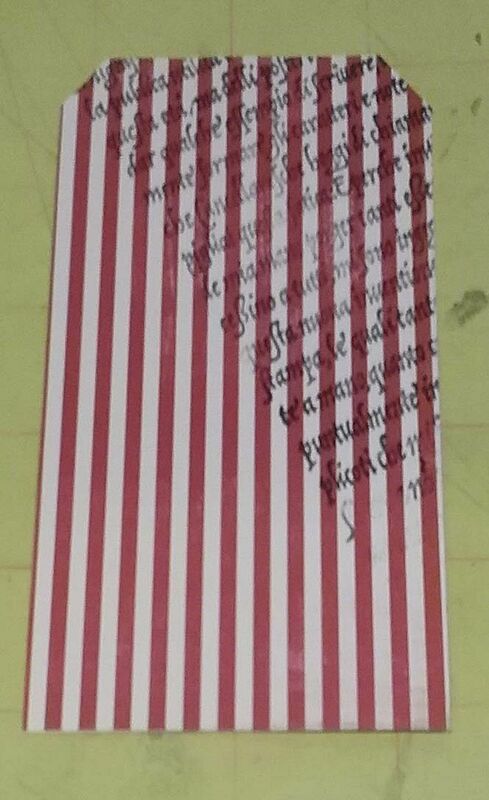 The balloon is painted red and backed with paper from the paper pad. The basket is painted gold and a black ribbon is tied around the middle of the balloon. At this point I decided the bottom needed more ribbon so I added black lace to the back and a black, white and gold braid to the front. Adding these touches of black to the bottom balances out the black ribbon tied around the balloon. Final touches are the red bird, white swan (painted black and rubbed with Inca Gold Gilders Paste) and a heart stick pin threaded through a red glass heart bead. Just as with the red tag, I started by covering the manila tag with papers from the paper pad. 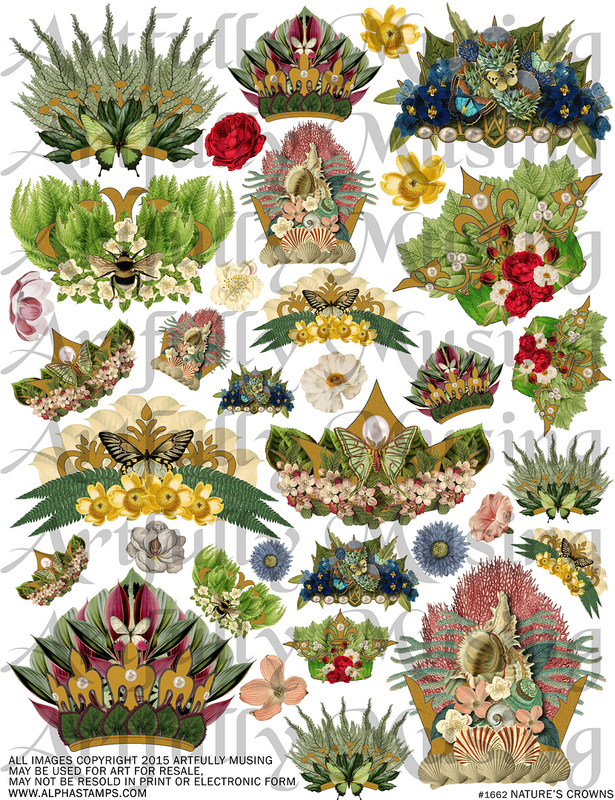 To build up the background, I added a faux postage stamp from the Bees collage sheet. To the bottom I added a white and gold lace. 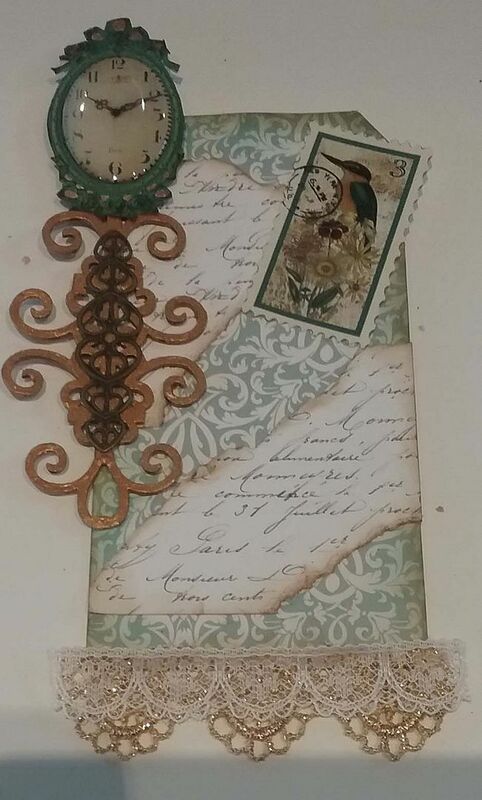 On the left side I added chipboard flourish painted gold. 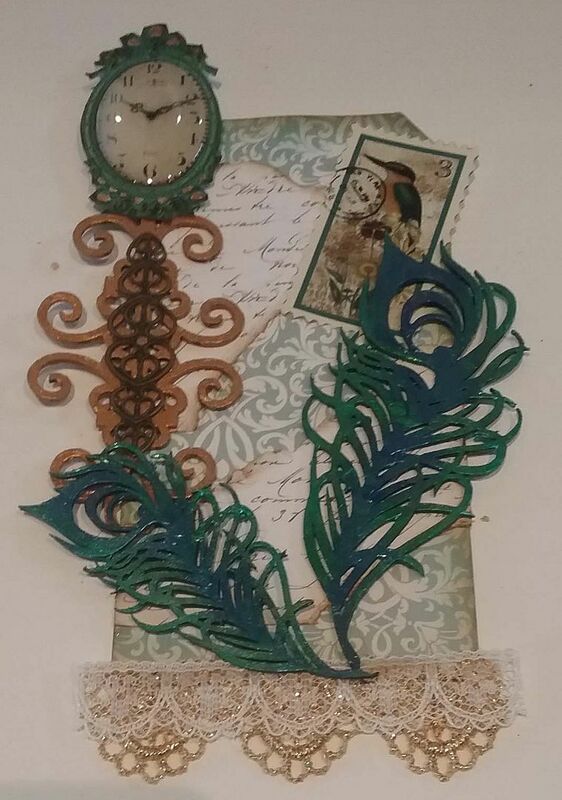 The flourish is accented with a piece of bronze filigree and a clock from the Tick Tock collage sheet. I added Glossy Accents to the clock face to give it a glass like domed appearance. Next, I added chipboard peacock feathers painted with Liquid Pearl paints. 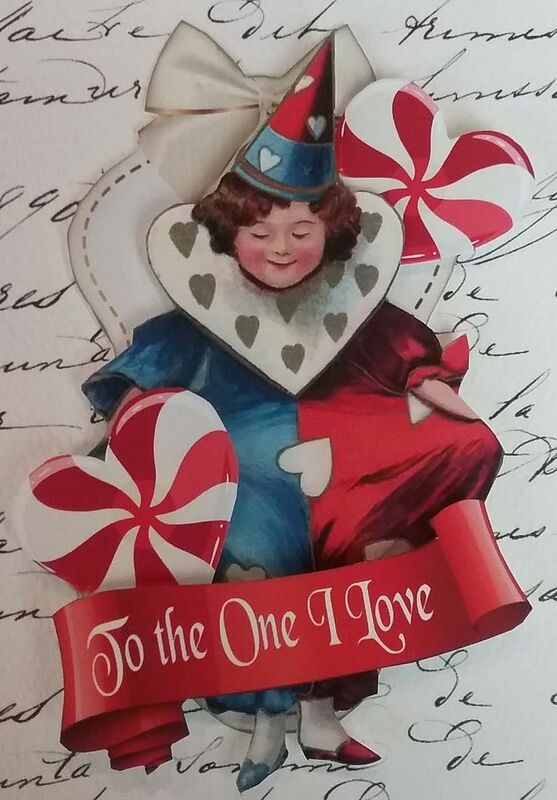 I continued by adding the woman to the center, flowers at the bottom, a heart stick pin glued behind a heart button (with the shank removed) and three butterflies from the Butterflies and Moths collage sheet. 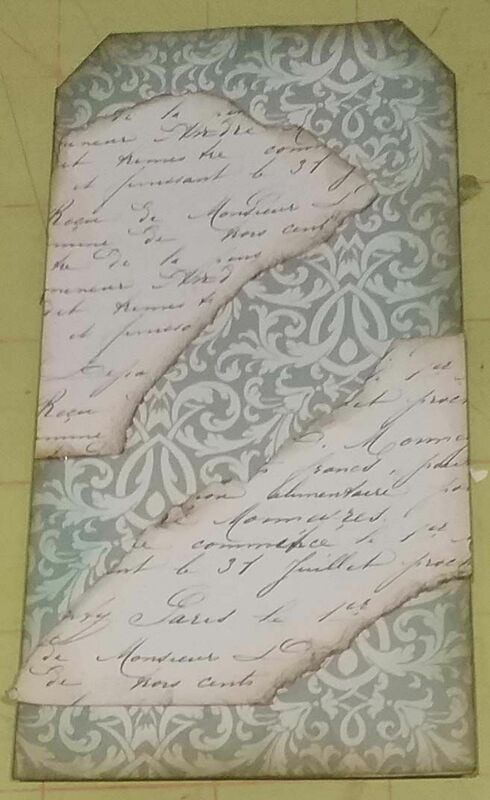 Again I started by adding papers from the paper pad to a manila tag. Next, to the top of the tag I added three leaves, ribbon and a piece of filigree. To the bottom I added gold lace, cream lace and pink sweeper fringe. 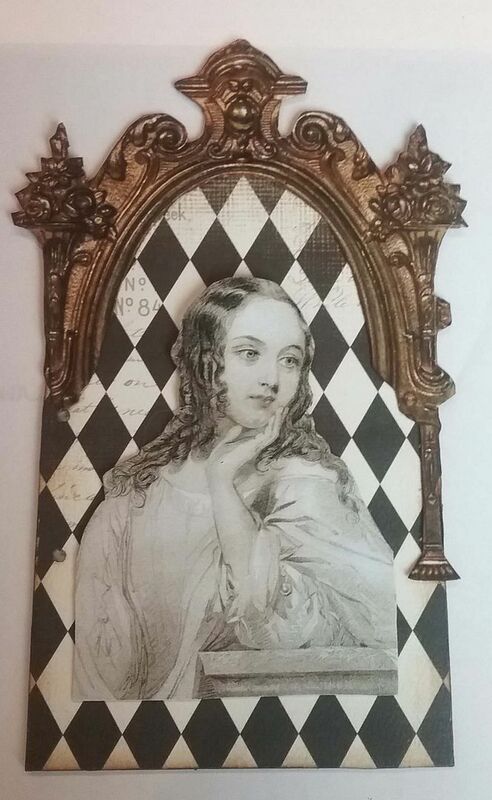 I then added the image of the woman (both behind the frame at the bottom and on top of the frame at the top) then attached the frame to the tag. 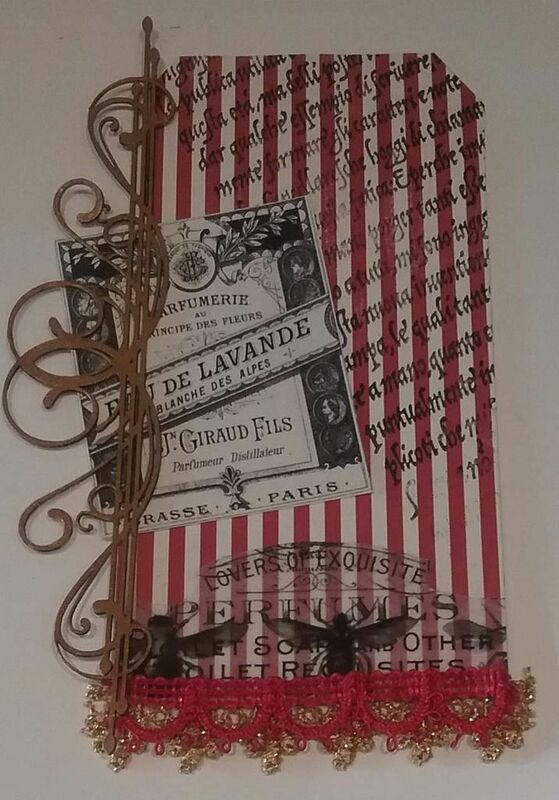 The frame is from the Elegant Frames digital set and is popped up from the background. 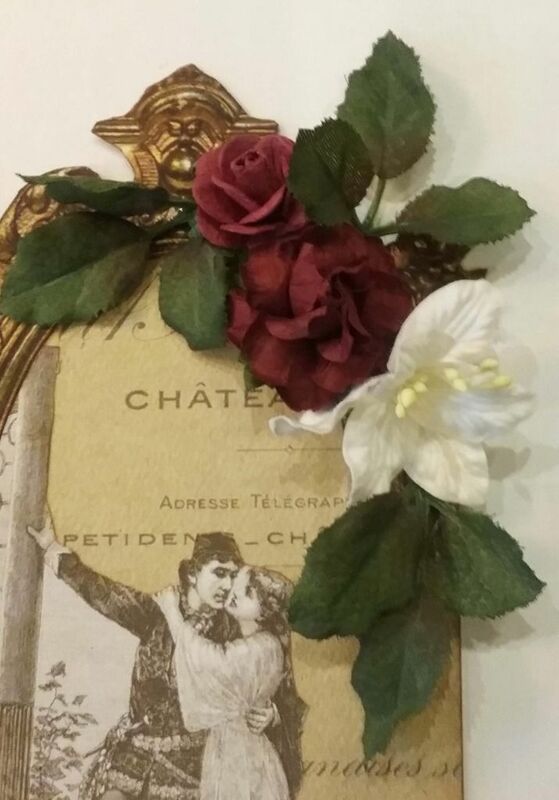 To the sides of the frame I added berries (these come in the set with the leaves) and a heart stick pin threaded through a puffy bead heart and a cherub button glued between (shank removed). On top of the puffy bead heart I glued a piece of filigree.